A combination of Tony Starks AI, J.A.R.V.I.S. and a synthetic body made by Ultron, Vision becomes the hero needed to defeat the supervillain in the MCU film Age of Ultron. Powered by the Mind Stone, one of the powerful Infinity Stones, on his forehead, the Vision eventually becomes a member of the Avengers. 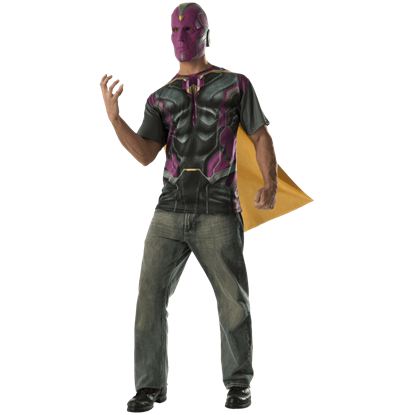 At Superheroes Direct, we stock a variety of Vision products, including Vision apparel and collectibles. 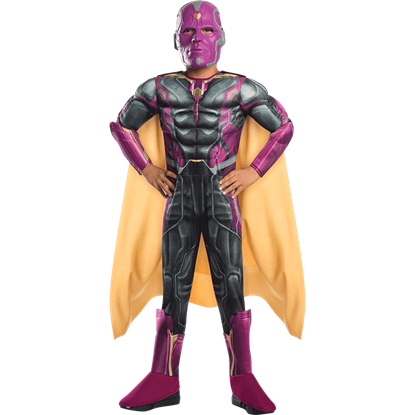 Dress yourself as your favorite new Avenger with our Vision adult and childrens costumes, or equip a keychain to take your love for Vision with you wherever you go. Our Vision t-shirts are a great way to casually show off your fandom. 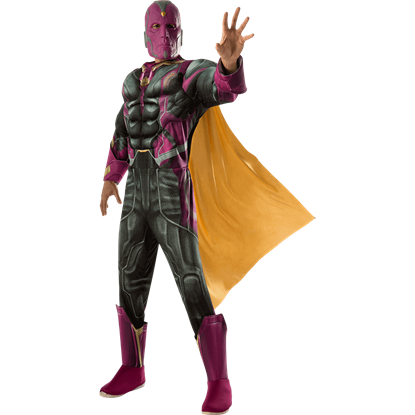 Vision POP figures make great collectibles, while our Vision paperweight features a take on the character more reminiscent of his comic book appearances. 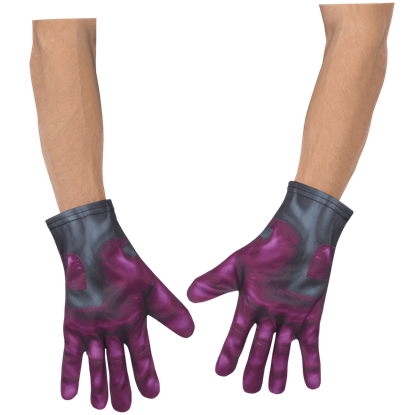 Featuring printed purple and grey details resembling his look from Marvel film Captain America Civil War, the Adult Civil War Vision Gloves are must-have accessories for dressing up as this unique, Mind Stone-powered superhero. 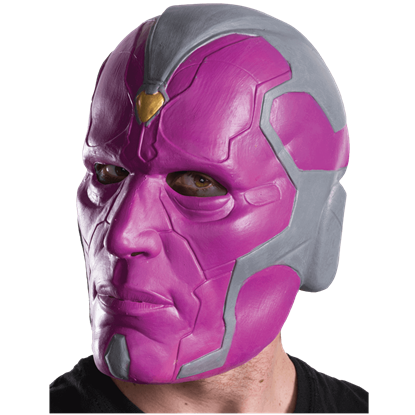 The Adult Civil War Vision Mask is perfect for achieving the distinct look of this Marvel Avenger. Featuring a 3/4 style that covers the front and sides of the face, this mask is a must-have addition to any Vision costume. 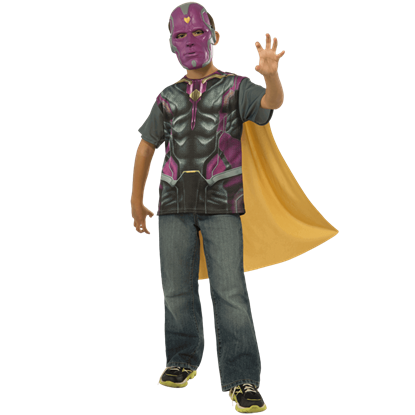 With its muscular details, printed features, attached cape, and mask, the Adult Deluxe Vision Costume Top and Mask Set provides the essentials for getting the look of Marvels purple-faced, Mind Stone powered, synthetic superhero. 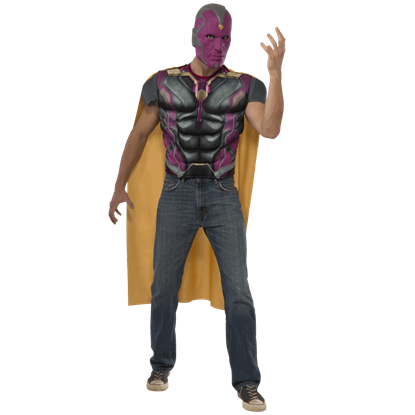 Fans of Marvels Vision can now dress up as this purple-faced Avenger with the Adult Marvel Civil War Deluxe Vision Costume. This officially licensed costume displays a detailed version of his looks from Captain America Civil War. 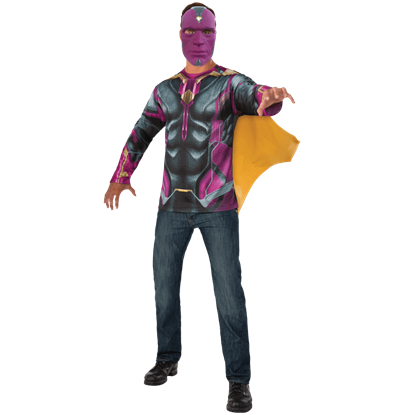 The synthetic Avenger Vision may look a bit odd in human clothing, but his superhero style sure makes a great costume. 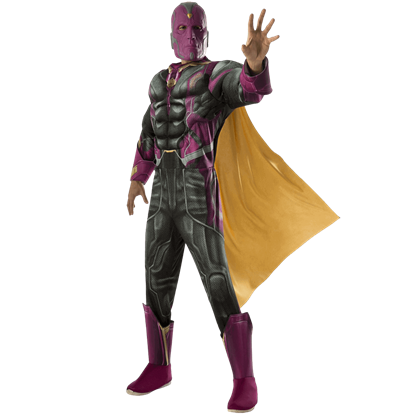 The Adult Vison Costume Top and Mask Set is inspired by his purple look from the Captain America Civil War movie. 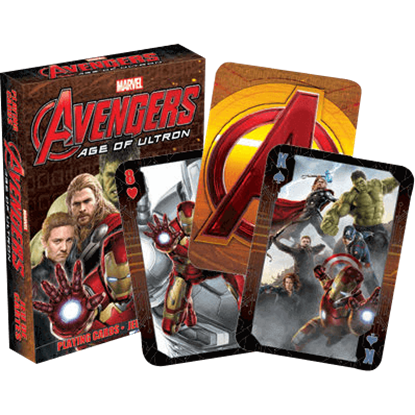 The Avengers return in the sequel film, Age of Ultron, to defeat a technological enemy bent on the destruction of the human race. 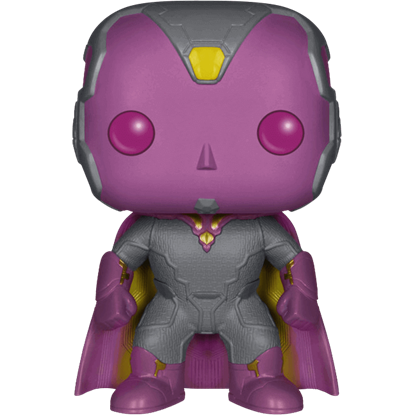 The Avengers 2 Vision POP Figure depicts the android superhero created to help defeat Ultron. 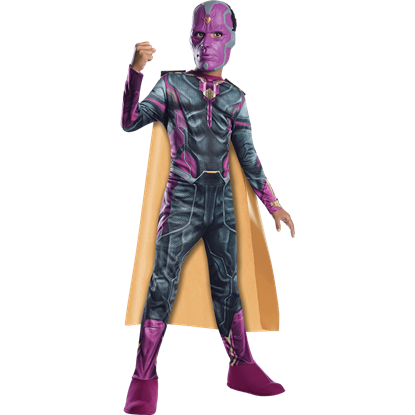 Marvel superhero Vision made his cinematic debut in Avengers Age of Ultron, and now your child can dress as this ultra-powerful Avenger with the officially licensed Kids Avengers 2 Vision Costume Top and Mask Set.